What Is The Best Chinese Cleaver? 2 What is a Chinese cleaver? Chinese cleaver is one of the most versatile utensils you can possibly purchase. Choosing the best Chinese cleaver may not be the easiest task for those who are not familiar with cleavers. That’s exactly why I’ve put together this guide, which will help you choose the best Chinese chef’s knife for your needs. To put this guide together, I’ve read countless of Chinese cleaver reviews and used most of them myself. We will talk about some of the best models you can buy, and will also go through some of the aspects you ought to consider when choosing the best one for yourself. Now let’s get started with the guide. I’ve put together a table representing some of the most popular Chinese cleavers on the market. They are listed in no particular order. What is a Chinese cleaver? Chinese cleavers bear their current name because they originated from China. They are being used there for centuries. Japanese chefs adopted the cleavers as well and they are now called “Chukabocho”. The cleaver has a slightly different shape than a traditional sturdy western cleaver. The blade has rectangular shape, and very sharp edge usually ground in about 16 degrees angle. What’s so unique about the cleaver is the fact that it’s extremely versatile. While most other kitchen knives are designed to do only one thing well, the Chinese cleaver can be used in many situations. It can be used for chopping, slicing thin pieces of vegetables, peeling or even deboning. The flat surface of the blade is great for crushing garlic cloves. If you need to pound some meat, the spine of the blade can used for that. Now if you are asking “Isn’t a boning knife better for deboning or isn’t a smaller knife better for peeling?” the answer is clear – yes they are better. But the Chinese cleaver can still be effectively used for these needs, and that’s what makes it great. In this section of the guide, we will take a look at some of the best-rated Chinese cleavers currently available on the market. Yaxell is well known for making high quality and good-looking kitchen knives. 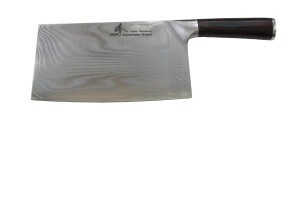 The full tang 7-inch Ran series Chinese cleaver is no exception to this. The blade is made of the VG10 stainless steel 34 layers of high carbon steel on each side. I have to say it’s one of the best looking cleavers I have ever seen. But a look is not what cuts the food, right? The blade is extremely sharp, and thanks to the layers of carbon steel, it’s also corrosion resistant. I would not put it in the dishwasher though. The handle is made of Micarta. Micarta is a durable composite of thermosetting plastic and other materials such as linen, paper, or glass fibers. Two rivets were used for fastening. If you were looking for one of the best-rated luxury Chines cleavers, I would definitely recommend this one. It has received very positive customer reviews. One downside of the cleaver is its high price, which will surely be too high for some. 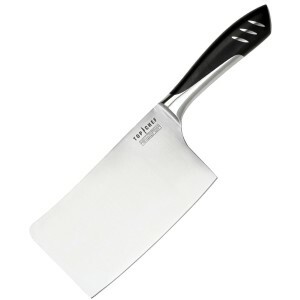 Buy this cleaver on Amazon! Wusthof needs no in-depth introduction, as every cook knows this German company. Their Chinese cleaver is surely worth looking at if you are considering a purchase of a cleaver. The Classic Chinese chef’s knife is fitted with a 7-inch blade made of alloyed stainless steel. It is razor-sharp, but it must be noted that the manufacturer doesn’t recommend using it for chopping bones, because it could damage the blade. For other food, it will be an excellent choice. The handle is triple riveted with full tang running through it. It utilizes the traditional time-tested Wusthof design. One of the main advantages of this cleaver over the Yaxell one is that it is not as expensive and some of you may prefer the look of the plain steel as opposed to the layered steel. The last member of the expensive group of cleavers is this model by Zhen. Similarly to the Yaxell one, this full tang knife has a layered 8-inch blade. The core is made of high quality VG-10 stainless steel, and the sides feature 33 layers of Damascus steel, creating a beautiful pattern. It is rated at 60-62 HRC. Unfortunately, it is only designed to chop veggies, fruits and meats. Avoid chopping bones with it. If the 8-inch blade is too large for you, Zhen also offers smaller versions of the cleaver. The handle is made of Pakkawood, which provides secure grip and prevents slippage. The knife is made of Japanese steel, but it’s not actually made in Japan. It’s manufactured in Taiwan. The previous cleavers were on the rather expensive side of the spectrum. For those who are not prepared to spend so much on a kitchen knife, I’ve also put together a list of great and inexpensive Chinese cleavers. 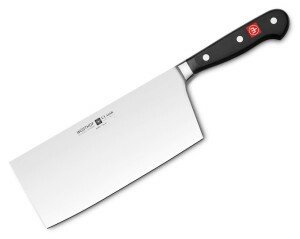 If you are tight on budget, you may consider getting this inexpensive cleaver by Top Chef by Master Cutlery. The blade is 7 inches long, and it’s made of ice tempered x30cr13 stainless steel. It has hollow ground to prevent slices of food sticking on the blade. It ships super sharp and will likely not need to be sharpened before use. Even though stainless steel has been used, I would not recommend putting the knife in a dishwasher. Unlike some of the other cleavers, this one can also be used for chopping bones. The handle is quite comfortable and feels good. It also has an anti-slippery finish, which is always important for me. Overall, this is one of the most popular cheap cleavers on Amazon with many of the customer ratings stating that it’s very sharp and can endure a lot of abuse. If the previous model was still too expensive for you, I present you the Winco Chinese Cleaver. At the time of writing, the knife had over 100 customer reviews on Amazon and majority of them were positive. It is one of the larger Chinese cleavers with its 8.3-inch blade. The blade and the whole knife are made of stainless steel. To prevent slippage, the handle features couple of notches, providing secure grip and comfort. The blade is quite thin and I think it would not survive a lot of bone chopping. It’s more suitable for veggies and deboned meat. The manufacturer states the knife is dishwasher safe, but I would still recommend hand washing. Here’s the last well-made Chinese chef’s knife I am going to present you today. It’s actually made in Japan, and it has 7-inch blade made of stainless steel. Some people reported that the chopped food loves to stick to the blade. But given the super cheap price, it is a minor issue. One thing to keep in mind is that it’s not really suitable for heavy-duty work. I wouldn’t use it for bone chopping. A more durable and thicker cleaver is needed for that kind of work. 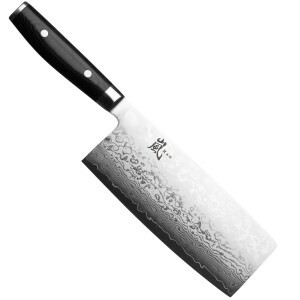 It comes very sharp though, and it’s really great for meat slicing and veggie chopping. The handle is made of Japanese oak, and provides secure comfortable grip. Given the low price and great customer reviews, it is certainly a good cleaver to consider. Just like with other knives, there are some considerations you have take into account when choosing a cleaver. Let’s go through them now. Construction – If you have read any of my other guides, you already know that I always recommend full tang knives. The Chinese cleaver is no exception. If you can, get a full tang cleaver. Partial tang knives are susceptible to breaking at the point where the blade meets the handle. If that would happen with a cleaver, it could end up with bad injury. Blade material – The choice here is usually between stainless steel and high carbon steel. Sometimes a mix of those is used. Carbon steel’s downside is that it is not corrosion resistant, and it tends to add unpleasant taste to the prepared food. Many chefs therefore prefer to use stainless steel knives. Blade length – Aim for a cleaver with at least 7 inches long blade. If you go for a smaller one, you would hamper the versatility of this Chinese chef’s knife. Blade thickness – Chinese cleavers are made in different variations with blade thickness being one of the important differences. Thinner blades are suitable especially for vegetables. On the other hand, if you were to chop a bone with a 2mm thick blade, you would likely damage the edge. For meat and bones, a thicker blade will be needed – something like 8 mm will be a good choice. Of course you take the middle route and choose a cleaver in between, which would usually be usable for both situations. You you’d just have to avoid chopping through thick bones. Handle – To some extent, the handle is a matter of personal preferences. The choice will most likely have to be made between wood, steel, or some sort of molded plastic. Wood has the advantage of looking really good unlike steel or plastic. Make sure you choose a cleaver, which will not slip out of your hand. Price – The price tag of some of the top of the line cleavers can be quite surprising for some people. If you’ll choose to purchase one of the Shun Chinese cleavers with layered steel blades, you can expect to pay more than 200 bucks. On the other hand, most chefs find they don’t need the most expensive blades in their arsenal. There are quite good cleavers what will not set you back by more than 50 bucks. Now that you know how to choose the best Chinese cleaver, it’s your turn to actually choose one best suited for yourself. If you have any other questions or comments, please use the comment form below the guide.